When and how should I lubricate my QB78? What accuracy should I expect from my gun? Can I use the QB78 for indoor shooting and target practice? 600 Feet per Second. Wow! How Fast Is That Compared to a Car? How Can I Remove the Safety Warning Label Attached to the Stock? I’m 6 Feet 3 Inches Tall. Will a QB78 “Fit” Me? I shoot cartridge firearms, how does the QB78 compare in size to a military rifle? How Many Shots Will a QB78 Make Before Running Out of Gas? Which Caliber is Better: .177 or .22? I need help with my order or account. I need to contact Archer Airguns. Everyone will advise that too much lubrication is bad for a CO2 air rifle, so don’t overdo it! Also, don’t just use any old oil as many petroleum-based lubricants will attack the seals on the gun and cause leaking. (This is BAD). Do use a dedicated airgun oil, such as Crosman ® Pellgun Oil, as this is designed to preserve the seals, not harm them. One recommended method of lubrication is to apply a drop of Pellgun Oil to the flat end of Powerlets when you load them into the gun. I’ve not found it necessary to this with every Powerlet, but it certainly seems to work and keeps the O rings supple. I also occasionally apply a couple of drops of Pellgun Oil onto the bolt where it slides inside the receiver. Some authorities warn of the danger of the bore rusting due to the use of CO2 as the propellant. Here, the arguement is that the refrigerant nature of CO2 will cause condensation of water vapour inside the cold barrel on shooting and - obviously - rust the bore if un-treated. I’ve never found this to be an issue in Up-State New York, but if you enjoy very hot and humid weather conditions and are concerned about this, it would be good practice to load a flexible cleaning “snake” with Pellgun Oil and run this through the bore after shooting. Overall, excellent accuracy is a hallmark of QB78 air rifles. These pellet guns certainly shoot better than I do, for a fact! Most of the test targets produced by Archer Airguns group 10 shots somewhere around 0.75-inches centre-to-centre at 10 yards. But this sounds very poor compared to claims you will have read elsewhere for other air rifles of “one hole” groups at the same range. So what’s the story here? Firstly, the Archer Airguns test targets are shot with 10 rounds, often with open sights, by “plinker grade” shooters using the full range of production guns and with one pellet type. Compare this to the “small print” of other advertising claims, where the results given are usually the best ever achieved with those guns, and normally with strings of only 3 shots! Who knows how many guns were tested to find the one which shot that well? Who the shooter was? How many pellet types were tried? What the scope was? How light was the trigger set? What type of stock was fitted? How many strings were fired to achieve this magic result? And can you ever actually achieve the same result yourself? (I’ll give you one guess at the answer: it’s no!). Normally, the first three shots in Archer Airguns test strings give a “one hole” center-to-center measurement of around 0.25-inches. This is more realistic and represents the level of performance which a “good” shot should expect to achieve. The biggest influences on accurate shooting found through extensive testing at Archer Airguns are (outside of technique): firstly the addition of a scope (Duh! ), second pellet type, thirdly trigger adjustment and fourthly the addition of a stock extension and/or cheek pad so help the shooter acquire the best sight picture. Of course, the best accuracy tests are the ones you conduct yourself, with your level of experience and technique, your sights, stock, pellet choice and the wind conditions on that day - if you’re shooting outside. The test results you receive from the Archer Airguns Gold Service and Additional Pellet Tests will set you well on the way to finding that answer, but the journey there is all part of the fun of airgunning! The relatively low muzzle energy and quietness of QB78 air rifles make them ideal for indoor shooting in cold weather, at night, in the rain, or any other time when you simply want a little target practice but can’t get outside to shoot. Just one other tip. If you want to make your own targets to shoot indoors, don’t print them on standard 20-pound copy paper. Yes it’s cheap, yes you probably have some in stock already, but it makes a terrible target because the paper tears so badly that it’s tough to tell where the shots really went. Use a heavier weight of paper, it’s worth it. Check your computer printer specifications for the heaviest weight of paper which it will transport and find a supply. Archer Airguns targets are printed on 67-pound card stock as this gives clear holes and minimal tearing. Much, much faster. Pellet velocities are measured in feet per second (fps). Here’s how this compares to the more normally encountered Miles per Hour. The QB78’s pellets typically travel at 300 to 500 mph! The factory really doesn’t want you to do this, these labels use a very tenacious adhesive! But, if you want to remove it, the best method is to soak the label a couple of times with Goo Gone ®. Once the label becomes somewhat transluscent, use your thumbnail - or some other blunt tool, to carefully remove the label. Goo Gone ® itself will not damage the stock finish, just make sure that you don’t either when removing the label. Let’s compare the QB78 to a typical, well-known military rifle: the German Kar 98k of World War 2. You will see that, overall, the rifles are fairly similar in size - which is not surprising as the Crosman 160 - the precursor of the QB78 - was designed with military training in mind. The main differences are weight, recoil and noise (you wouldn’t want to shoot the Kar 98k in your basement!). So the QB78 is very suitable for indoor shooting and target practice in Winter or bad weather when you can’t shoot cartridge firearms outside. 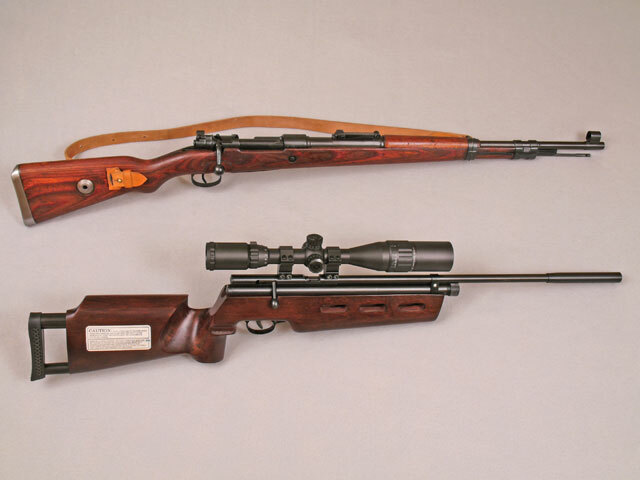 The photograph compares an ARcher Airguns AR2078A Custom and scope to a Kar 98k. The basic answer is “about 50 to 60 good shots from one set of Powerlets”. But this is a tough question as it depends on temperature, caliber, the performance of the gun itself (QB78s with lower muzzle velocity typically give a few more shots before running out of gas than ones with higher muzzle velocity) and the weight of the pellets. These issues apply to all types of CO2 pellet guns and air rifles. For a more complete story, read the technical article elsewhere on this website. The QB78 looks, feels and handles the same in both calibers. Only the barrel and breech bolt assembly differ between the .177 and .22 models. So which to choose? Testing by Archer Airguns shows that the .177 model gives a slightly more consistent muzzle velocity per shot than the .22 caliber. Typically, velocity standard deviation will remain under 5 fps up to about 30 shots for the .22 caliber and up to about 50 shots for the .177. This is based on a 90 second gap between shots. Clearly the .177 gives more useable shots per fill than the .22. Indeed, because of the decrease in muzzle velocity of the .22 over 50 shots on one pair of Powerlets, the .177 caliber model provides the higher muzzle energy beyond that point! There’s no significant difference in accuracy up to the maximum number of useable shots per gun, but the higher muzzle energy of the .22 will make it more suitable for hunting.